Apple has started airing three new Mac ads that focus on an Apple Store Genius who is called upon in three unusual circumstances. The TV spots started during the Olympic games and are quite unlike other ads Apple has put out recently. For the longstanding Apple users and technically inclined amongst us, they come across as quirky and even awkward, but it’s obvious the target audience here isn’t loyal Apple customers. Instead, the commercials are aimed at swaying newcomers to the Mac platform who haven’t yet experienced the convenience and ease of owning a Mac, or the excellent and savvy customer service the Genius Bar provides at Apple Store locations. What do you think of the ads? They are being lambasted across the tech web as “awful” and “embarrassing” but are the tech pundits missing the point here? Are the commercials really that bad? Personally, I’m just happy to see Apple advertising for the Mac again, since these days the iPhone and iPad tend to get most of the attention. These ads are “cute” if you don’t already own an Apple product. The “Basically” ad reminds me of the “I am a PC …” ad but not as hard hitting. Overall a B not as good as the “I am a Mac and I am … ” ads. I think Apple needs to get those running again. Maybe use different actors since so many players have changed? I like these ads but they don’t seem “Apple”. If Steve was still alive I don’t think we would see these. They’re not bad ads. They’re pretty cute like the above commenter said but overall I don’t think it’s a good direction for Apple to go in. I’m sorry but I watched all three ads, and CRINGED – no one, ever is THAT helpful and pleasant, and he’s too perfect – un natural. May be the ads are for the US market, if so, great, they would turn off many australian’s if the ads played here. Coming from a tech perspective, they were not intended for the advance or intermediate customer base, but rather the novice end user. That is who they are trying to appeal to. They’re not “I’m a Mac and I”m a PC” commercials. BUT, I think they did a good job, especailly with the last ad. There are plenty of Mac “look-a-likes” out there from PC OEM’s making the silver looking laptop and creating cases that look like a Mac Pro. It is easy for the average end user to get confused and sucked into something they do not want. I thought they were kinda witty too. But, that is just my opinion. Good job OSXDaily for the articles! Awful. Truly awful. Steve would be ashamed. I like the ads better that the celebrity ones. But I don’t think the last one is as good because it doesn’t talk about the Mac. You shouldn’t mention the competition at all. These ads is more like to say that people are idiots ( no offense ) . If Steve was alive I don’t think that he would let this happen. I like them a lot! The one in plane shows that people might think it’s difficult, but shows it isn’t and a genius can help. And maybe Steve Jobs did know about these, but anyway Apple must go on without him and they can’t keep thinking what would Steve Jobs do. Because they will never now. But Apple products are supposed to be very easy to use and learn. If you need a genius to show you how to edit a simple movie in iMovie or make a card in iPhoto…. well, what does that say for Apple software? I couldn’t agree with you more. If the Apple products are so easy, why would you need a “genius” to show you how to use them. I just can’t see Steve Jobs approving these kinds of commercials. If this is the stuff the Ad agency is coming up with maybe it’s time to look elsewhere. Think different? Tt looks like a Best Buy Geek Squad Ad! Heaven help us…. Good point. That was my first thought. I agree with those who are saying it’s not Steve. That’s not always a bad thing, but in this case I think it is. Using iLife as a selling point is fine, but the feel is just like a verizon or dell commercial or something: too normal. Disappointing. And even though I’m sure the “look-alike” one has happened to someone before, it feels really condescending. Bad form. Love them. Feel they will appeal to novices and another very important market, older individuals who can relate to the misplaced panic displayed by recipients of geniuses knowledge, skills and ability. CRRRRRRRINGE is the catchword here. embarrassing for mac. i HIGHLY doubt these would have seen the light of day if steve was still here. REALLY for the non-mac people the slick, smooth-talking ‘genius bar’ characters, i would say are quite a turn off – confusing in their ‘style’ of mumbo-jumbo. possibly in the USA where people are caught up in superficial imagery this can ‘sort-of’ fly. 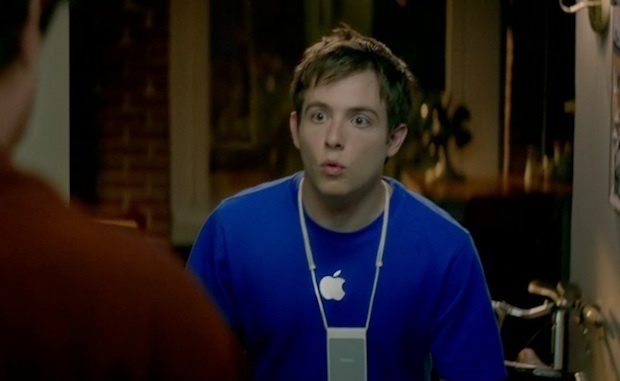 I like Apple, but c’mon… these ads are mediocre at best! Doesn’t take a Don Draper to do a better job. What a hell? Its not apple at all. Total crap! I think some of you miss the point of the commercial as well. The sub-liner of these ads is that the Apple Genius is there to help and that they have all the information you know even at your most desperate moments. Yes, you can argue that if iMovie is so easy why he needs help, but if you really want to go down the “let’s analysis this to no end” route, the guy complain that there are a lot of footage, he was in panic and need to load everything together quickly, he needs advice and someone to rely on… which back to my first point. These ads are fine and it did what it needs to. This is coming from someone who is a professional in marketing for years. Ads are subjective things sometimes, but these ones are fine. So what’s the point of a Mac anyway? Just because they have geniuses? I mean, you could ask any random person to help you with editing on a PC as well. I saw these on my Apple Start page and loved them. Had to google search it to find more information and came across this. I didn’t realize so many people dislike these new adds. Guess I wasn’t really look at them from a future Mac user or current Mac user perspective. Writing wise, I found them quirky and amusing. The long pauses and awkwardness of the whole thing is appealing (to me). I did re-watch them, however, and the “Basically” add didn’t strike me as it did the first time. It doesn’t really talk about the product, just mentions that its competitors (which isn’t Apple) doesn’t have Apple programs. Kind of a low blow there. I couldn’t figure out how to operate my Mac computer. Thanks to this commercial, I made a quick trip to my local apple store and scheduled an appointment with the next available Genius. Then a few hrs later the problem was solved. So easy, thanks Apple!